The fascinating blend of design and wellbeing is revived in this elegant and geometrically well-conceived Spa, where every element was studied to ensure the utmost comfort and convenience. Its advantage is the simple and quick installation, which – combined to the completeness of the details – makes it an ideal prêt-à-porter solution for those who want to enjoy a feeling of pure relaxation from the very first moment and in any environment. Santosa, which is available in a built-in and above the ground version, stands out for its st ainless steel structure, whose sides can all be taken apart to easily access even the smallest of spaces. The entire customization of the coating, the multicolored play of lights and the gentle Air-Massage system complete the experience, recreating a unique splendor for an inviting and timeless feeling of pure relaxation. 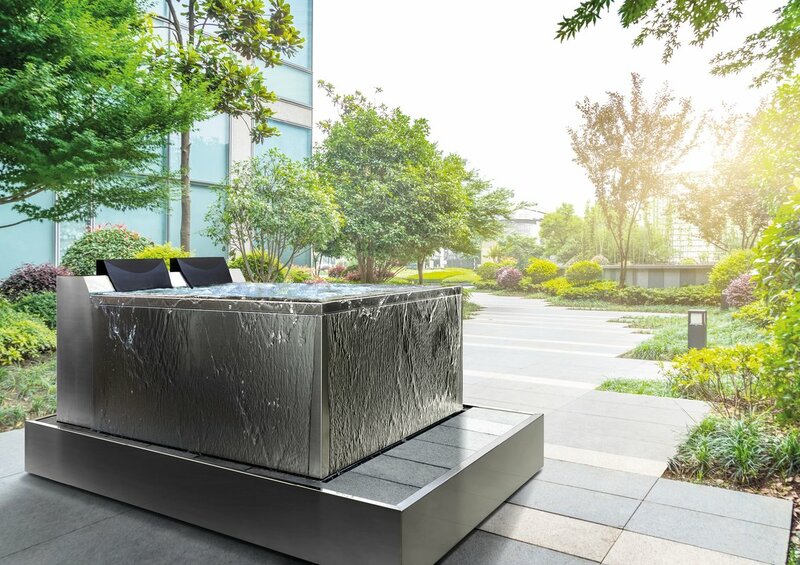 Santosa 05 is the above the ground outdoor or indoor solution that confers a touch of style and all the wellbeing of an Egoè Spa to any environment. The wide range of coatings and the optional high-tech equipment available, turn Santosa into a small, comfortable and elegant jewel that can be enjoyed in your own home or in the charming atmosphere of a green garden. Self-supporting structure in stainless steel AISI 316L fully TIG welded, reinforced with a tubular frame that can be disassembled into two sections: the technical part and the tub part only, so that it can fit into the smallest spaces. Removable panels on all four sides to allow easy access to the technical compartments and equipment. 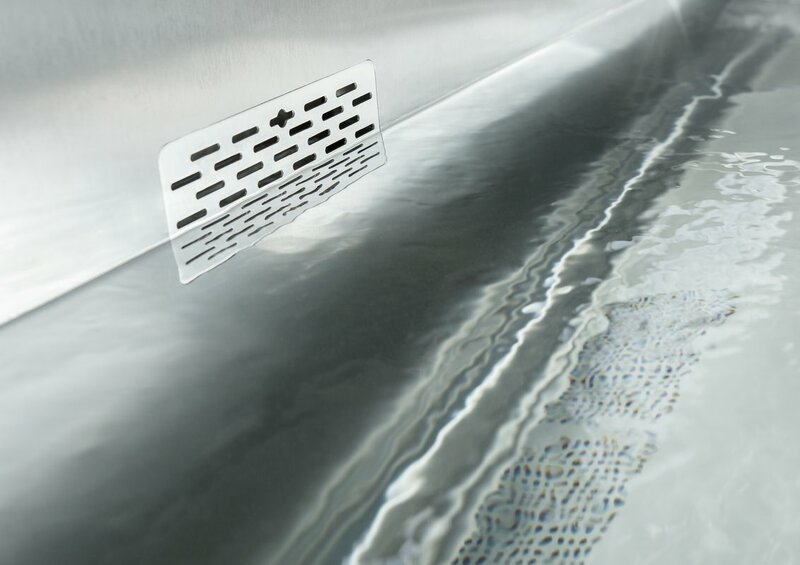 Microperforated plates, directly on the tub's frame to make the internal shapes look linear and clean; one at the bottom for suction and three to release the filtered water evenly over the entire surface of the tub. Due to their unique design, the technologies used and best of breed materials. 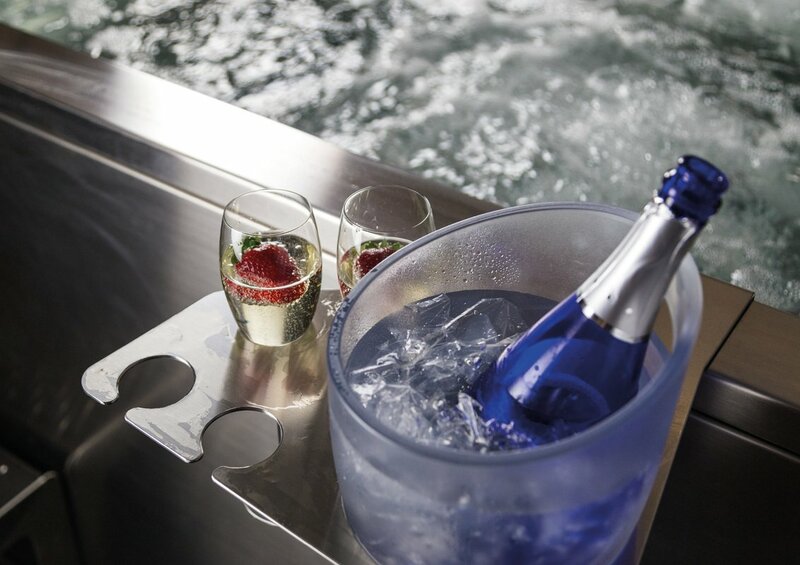 Egoè series stainless steel spas create an exclusive relaxing sanctuary in any environment, be it indoors and outdoors. 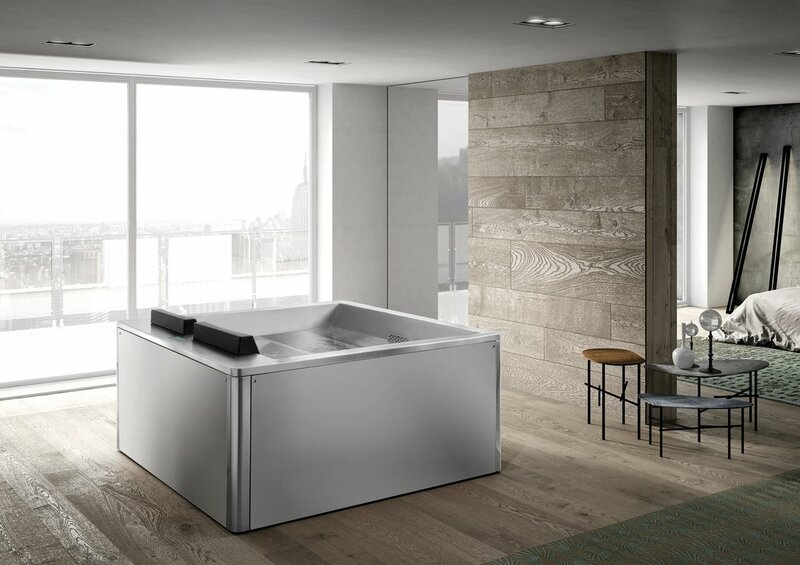 The spa designs offered by Egoè, an innovative specialist stainless steel spa manufacturer, will blend perfectly in any space to add an everlasting value to your property. 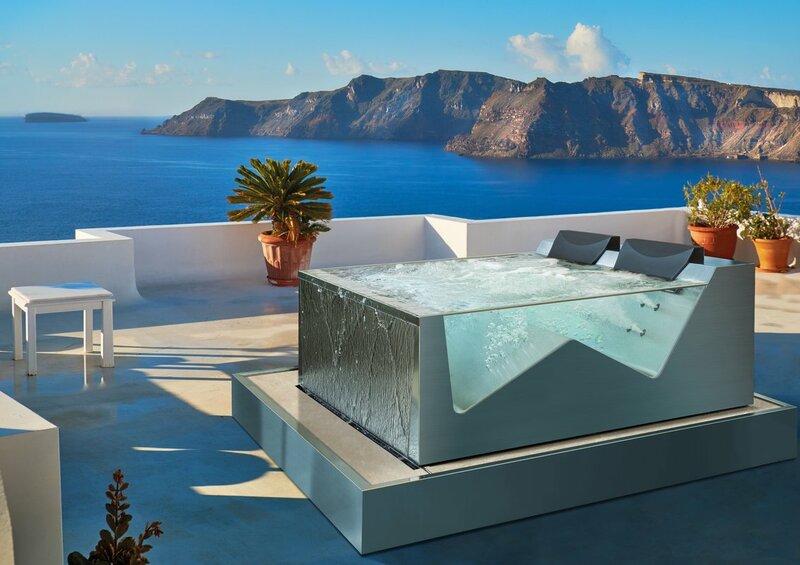 Due to the universality of stainless steel, our hot tubs offer a total freedom for designing the space around them. Every product is unique and customized to meet customers' requirements in terms of shape, dimensions and technical features. 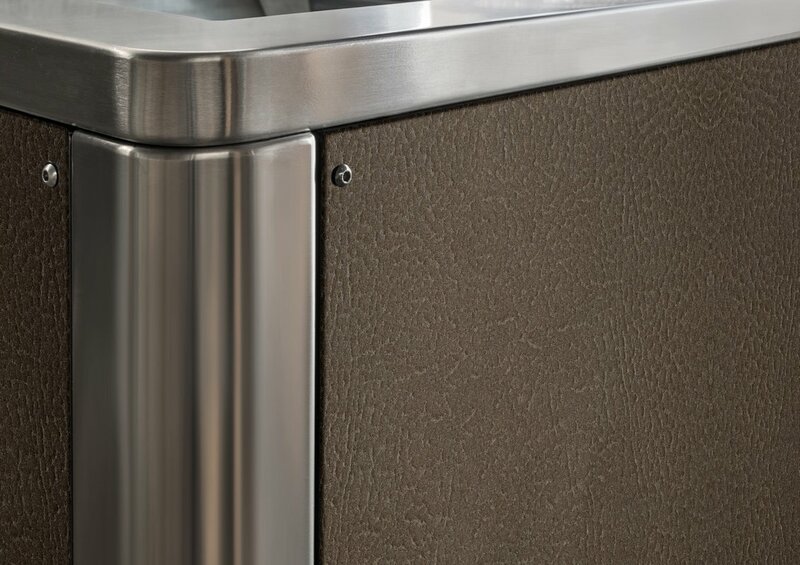 Stainless steel provides its own unmatched charm and distinctive appearance. 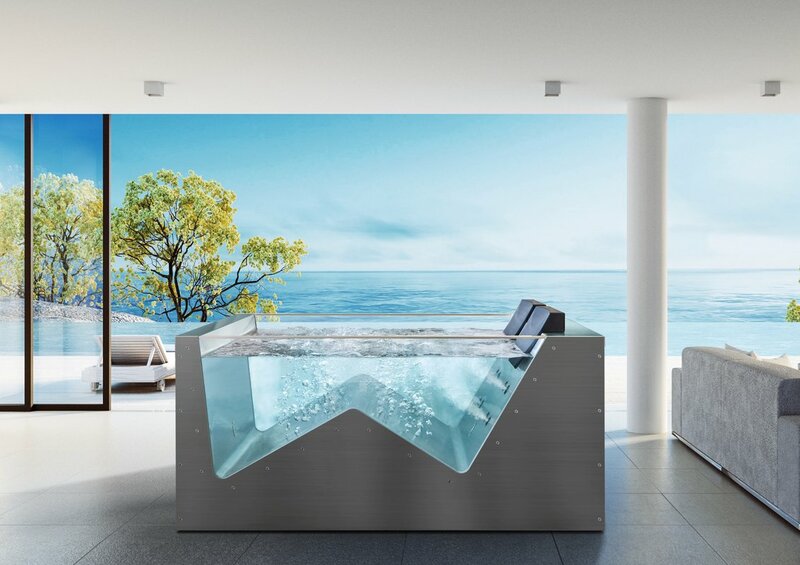 Alternatively, the inside of the hot tub can be, entirely or partially, treated with a highly resistant ceramic coatings, available in any color, or tiled with top quality mosaics. 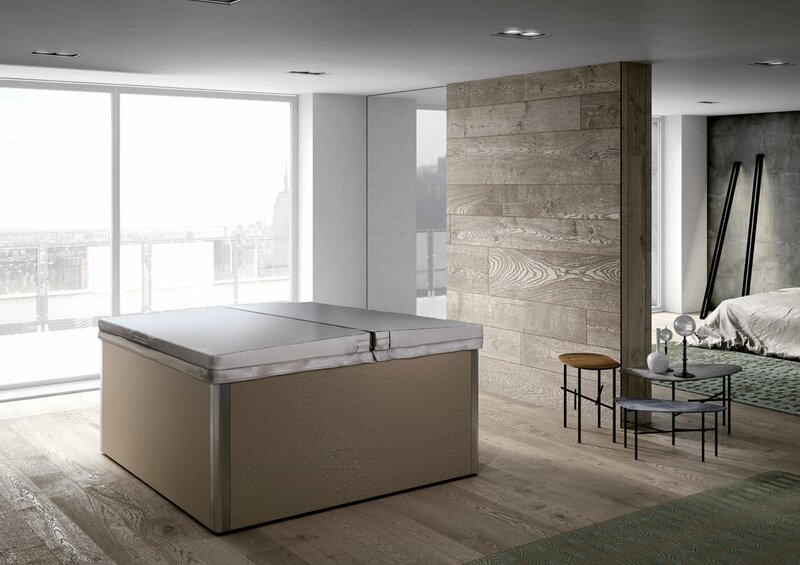 The outer panels of the some of our spa models are available with customizable coatings in various finishes to express any of your design wishes. The spa panels can be coated with fine marble, stone or mosaics. The design decisions for the seating positions, lounge seat design and accessory locations were made following a prolonged ergonomics study to address the needs of customers for a complete comfort and enjoyment. 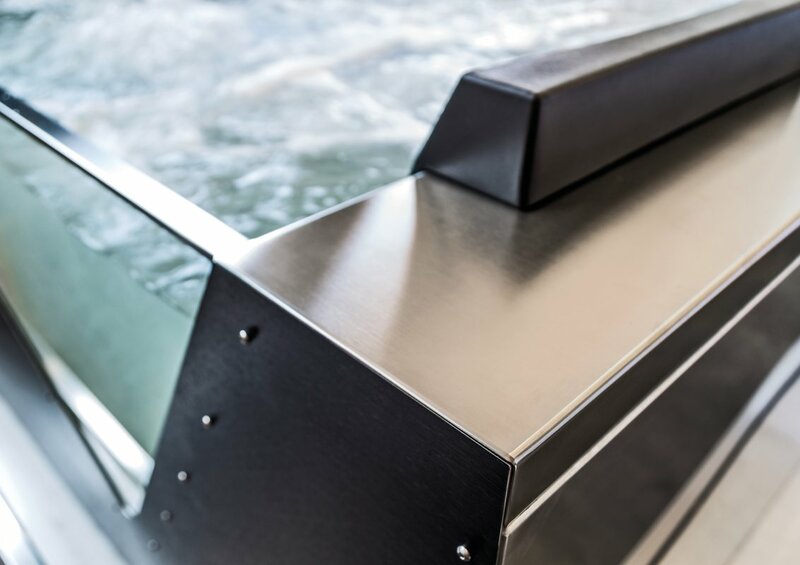 The stainless steel's resistance against corrosion ensures the mechanical durability of the jets and accessories over a long period of time, which means less maintenance is required while compared to other spa materials. Stainless steel is a naturally inert material and its properties make it especially suitable for its use in spas. The smooth surface of the material and the 40° radius of all corners (no sharp edges or corners) prevent the formation of deposits of dirt and other residue, thus significantly limiting the proliferation of bacteria and ensuring a very easy and effective cleaning. The appearance of stainless steel does not change over time; the material maintains its natural shine and luster without having to resort to any periodic surface renewal procedures. 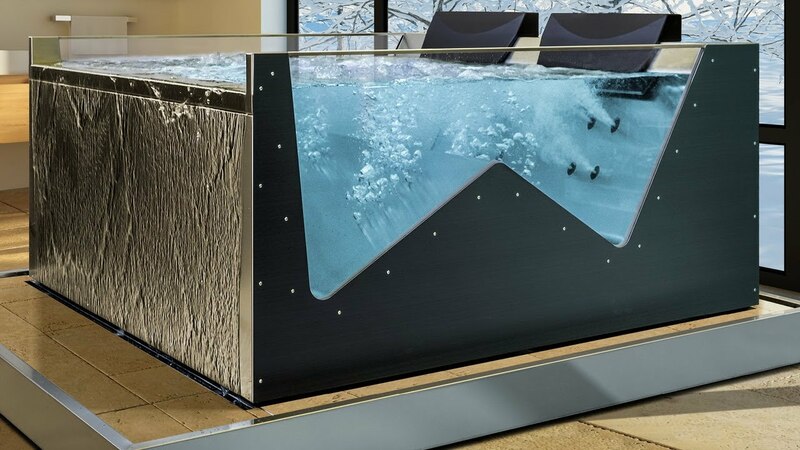 The elasticity and flexibility of stainless steel allows our hot tubs to withstand the ground shifting that might occur over time and to meet the safety requirements of earthquake-prone areas. Furthermore, if a heavy object should fall on its surface, there is no risk of breakage, nor any risk that the hot tub’s water tightness might be compromised. A spa, especially an outdoor spa, is subjected to extreme temperature variations caused by the hot to cold seasonal changes or because the pool is being heated while the outside temperature is below the freezing point. In addition, there might be times when the pool is full of water or when it's completely empty. For many materials, such variations in temperatures can cause cracks or blisters and deteriorate the surface finish. 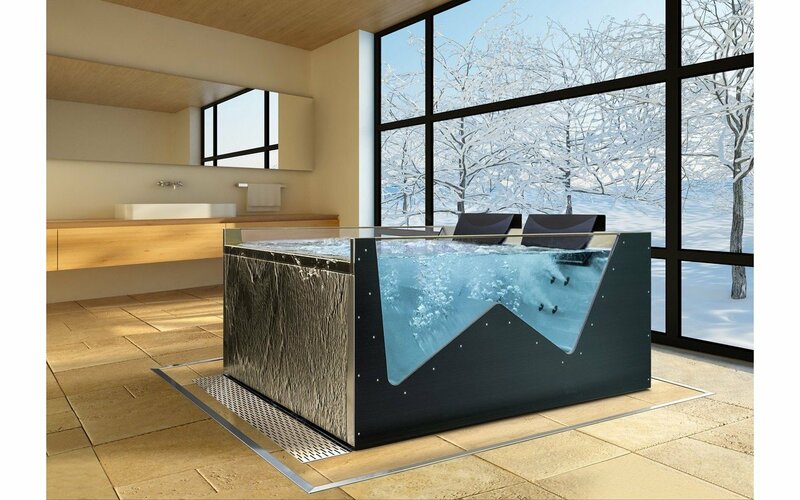 Stainless steel hot tubs, thanks to its superior material properties, do not suffer from any issues associated with extreme temperature variations. 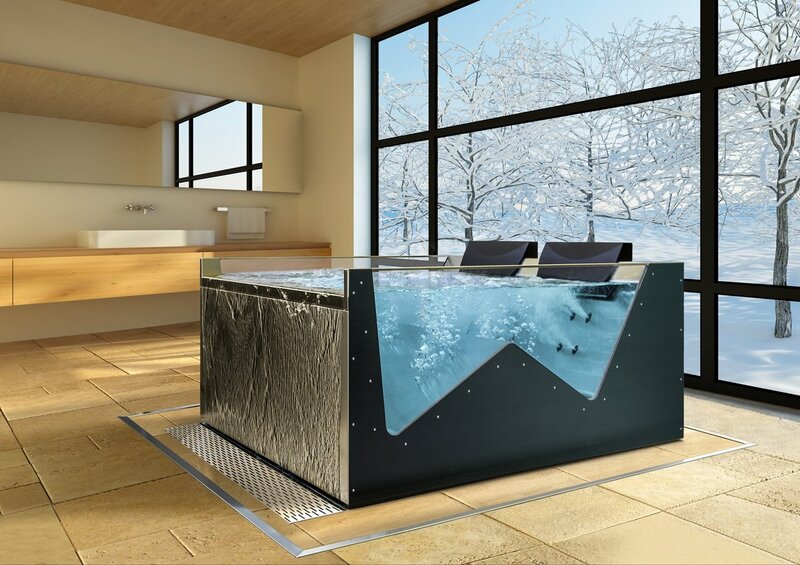 Our stainless steel hot tubs are self-supporting and have elevated hydraulic resistance. Since the entire perimeter of the structure is reinforced, there is no need to build a supporting wall or waterproof sheaths or barriers. For this reason, our spas can be installed in special places, such as terraces or raised floors, where the work must be limited and where the lower floors must be kept safe. Egoè Spas are all made with infinity edge: the water always remains at the same level and when you enter the tub you live the experience of entering a sea that is exclusively ours. 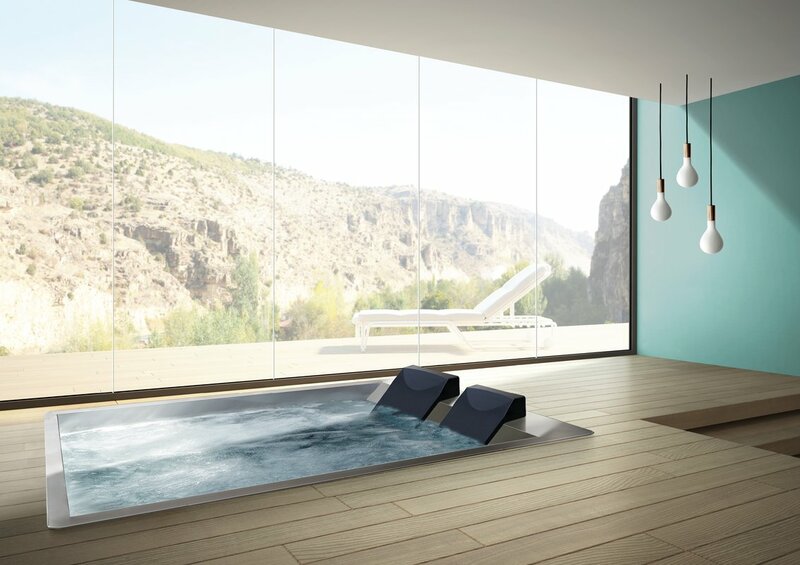 The infinity edge ensures that the water always remains at floor level, for a striking continuity between the elements. A distinctive feature, that denotes exclusivity and uniqueness in the residential sector. The result is a harmonious environment, beautiful to look at and pleasant to experience. The air massage creates a very mild massage effect that soothingly tickles the body, pleasantly relaxing it. Like a velvety caress, the air massage evenly relaxes the muscles throughout the body: the sensation is one of physical pleasure; the feeling of stillness and complete relaxation. 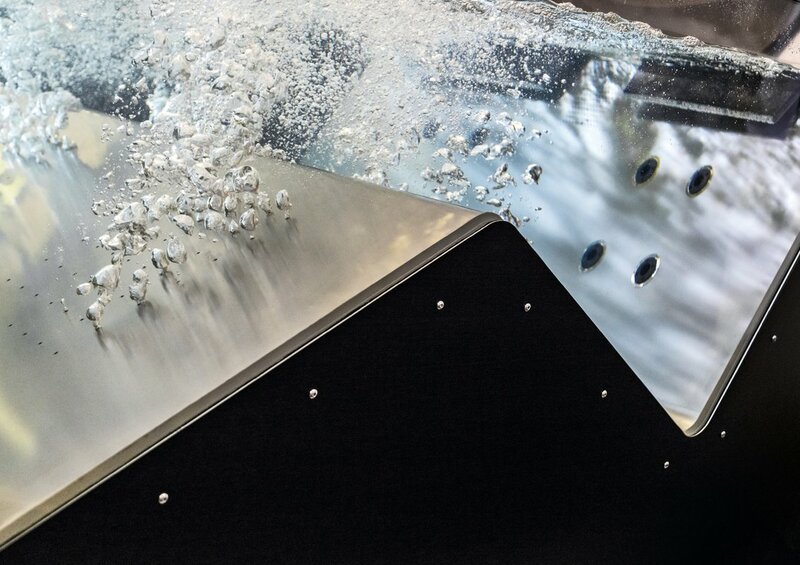 We offer a wide choice of finishes to form unique and distinctive spas. To stimulate sight and touch, making them reach an irresistible combination, all the inner shells and external panels are customizable with glass, tiles, mosaics, marble, ceramic and stone. 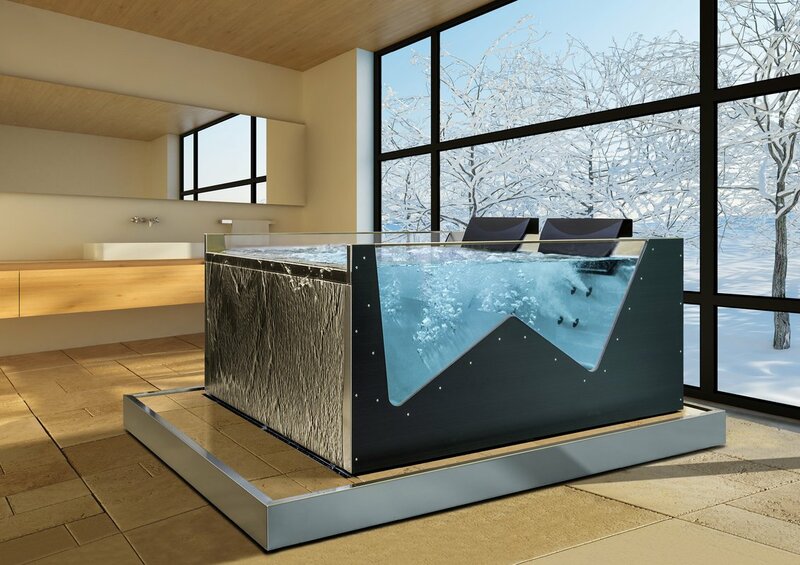 Our stainless steel spas are designed to maximize space and facilitate installation: the compensation tank and the filtration system are fully integrated within the perimeter of the hot tub. This system proves to be an important element that facilitates installation (no plumbing connections are required to external technical modules) and allows the installation of the spa in confined spaces (since no additional space is required for the technical module). Slow down and relax, enjoy yourself in a comfort: let go of your worries and enjoy a world that is private, protected and where you can feel truly unique. We offer the most with the modern minimalist design of the chaise-longue; a solution designed to provide great comfort thanks to the bottom air massage plates installed right inside the lounge seating positions, which guarantees even massage distribution throughout the body for a gentle and enjoyable massage. Light up the night with your favorite nuances and let sweet notes embrace you: custom colors and cozy melodies to create the desired atmosphere. Immerse yourself in the light and let the sweetest sounds surround you - masters of a world that belongs only to us: the interior and exterior lighting complete the pleasures of the spa experience as fascinating colors come to life. Aquatica offers exclusive sound systems: chose between our in-spa integrated audio system and our exclusive top performance DJ Aquatica. The scents tickle your sense of smell, enhancing the pleasure of the senses: the aromatherapy essences make for an even more gratifying feeling of well-being. Breathing the fragrances of nature, creating an environment where everything is pure pleasure: Aquatica spas come with optional aroma therapy system that we have named "aroma pleasure" – perfumed essences that are released into the tub and then in the air. 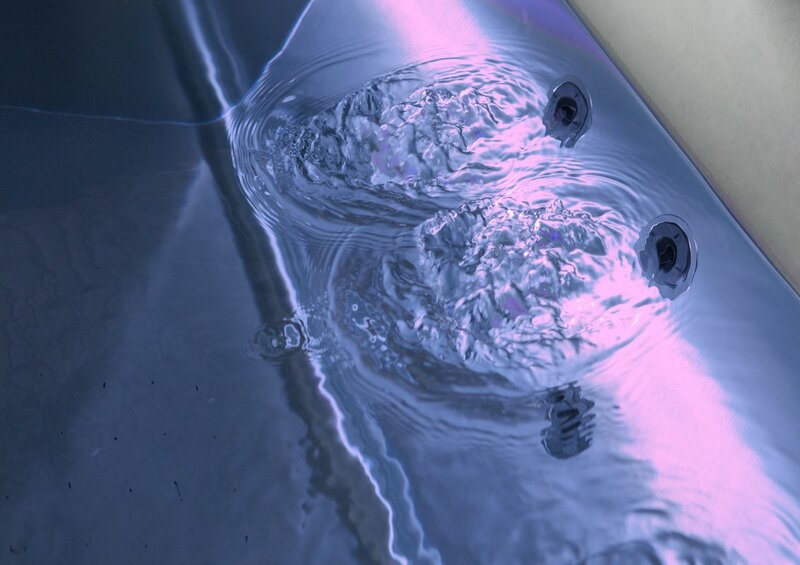 Our spas are equipped with an interchangeable cartridge filter or, for the larger models, a sand filter; they also come with an ozonator and UV treatment system. Optional automatic pH control is also available for commercial installations. Technology at the service of purity and respect for the skin. Treating the water with ozone, larger organic molecular cells (epidermal cells, etc.) are transformed into smaller molecules thus becoming easily decomposable by the filter. When it's cold, humans look for heated refuge: Aquatica hot tubs are a cradle of comfort, a unique warmth in which to be reborn. 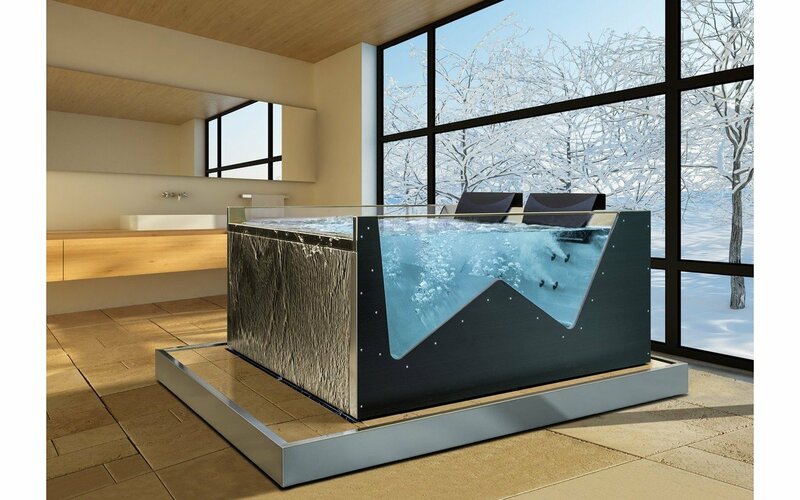 A haven of warm water where you can regenerate: to ensure the proper operating temperature (40° max.) Aquatica tubs are are equipped with 3-4kW heaters or, optionally, a heat exchanger for integration with your existing central heating system. The energy saving cover protects the spa from debris and excessive evaporation in indoor applications. Our cover has double insulation to prevent temperature loss and water evaporation. It is the perfect accessory to conserve energy.